This special purpose marker is designed to indicate increase and decrease rows. It is hand formed from 20 gauge wire and is snag free so it will not damage your fine yarns. It is fitted with a 6mm hyacinth Swarovski crystal bead. This marker fits needles up to a size US 5 (3.75mm). When knitting an Increase row, slip your needle through the Green ring. When knitting a Decrease row, slip your needle through the Red ring. On rows that are neither an increase nor a decrease, pass your needle through the silver ring. Most order ship the next business day. 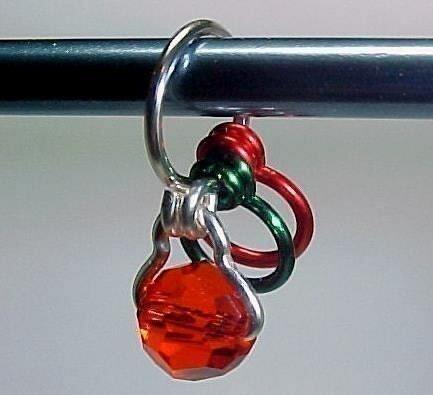 Love their increase/decrease stitch markers! I have several & will continue to buy more! I love these things- I have about 5 of them all around - because I can't seem to do increases or decreases without forgetting which one I'm doing if I don't have one of these handy! I purchased one of these previously, and found that I couldn't get by without another! These are such great knitting stitch markers to identify the increase round, the decrease round, or just continue in pattern when knitting my project. Fast shipping, and arrives packaged in a wonderful 'keeping' tin.